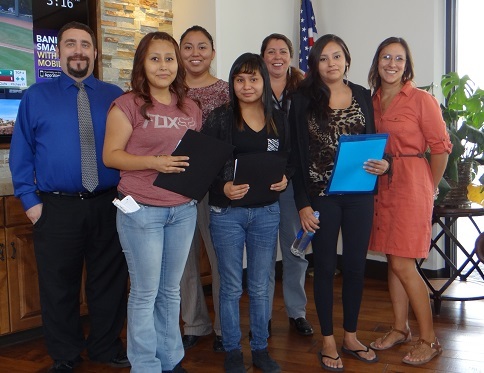 First Nations teamed up with longtime partner Gallup Central High School in Gallup, New Mexico, over the 2015-2016 school year to offer a multi-modal financial empowerment program for young student-parents. We worked with students who are enrolled in the Graduation, Reality and Dual-Role Skills (GRADS) program. The GRADS program is a class for student-parents as part of a statewide initiative in New Mexico focused on providing support and education to pregnant and parenting teens. In addition to working with GRADS teacher Tomi Jaramillo-Campos to implement financially-focused lessons and activities into the GRADS curriculum, First Nations has assisted the teen-parents in opening a savings account for themselves and their young children. All students were initially provided with a seed deposit of $50 for each of the accounts and were then challenged to save $50 to $100 over the school year, at which point they would qualify for an additional match of $50 for each of their accounts. Students created Financial Literacy folders that contained printouts of items they were saving for. 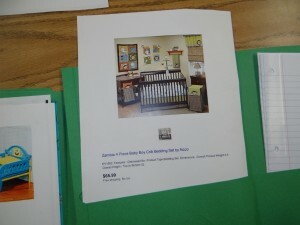 This student made plans to save for a crib bedding set. To date, 23 students have opened a Youth Savings Account (YSA) for themselves along with 14 Children’s Savings Accounts (CSAs) for their children. Students have managed to save $680 of their own money over the school year – not an easy task for a full-time high school student supporting a child! The sum of all open accounts is nearly $3,000 when combining student savings with initial seed money and a bank promotion. During a visit in April we held a savings contest for students who had saved money over the past three months. Students were given a raffle ticket for every $5 saved for a chance to win one of several gifts, including a grand prize of a family portrait package for their young family. In total, youth saved $531.28 between mid-January and the first week of April. The winner of the grand prize had saved nearly $150 since January with a goal to purchase a family vehicle. A second prize winner (of a $50 gift card at Foot Locker) had saved almost $250 since January by depositing money received from a 2015 tax return. Many savers informed us that their top savings priorities included saving for a first home and/or an automobile for their family. As the school year wraps up, students have a variety of options for their own and children’s savings accounts. “We were pleased to discover that many students have decided to continue savings towards their goals rather than close out their accounts,” stated First Nations Senior Research Officer Benjamin Marks. “We thank our partners for making this program a success.” In the coming months, GRADS students will be contributing last-minute savings before the end of the school year and will receive their match funds if they meet the $50 to $100 goal set by First Nations. This initiative is made possible through generous funding from the W.K. Kellogg Foundation. For more information about the program please contact Benjamin Marks, Senior Research Officer, at bmarks@firstnations.org or (540) 371-5615.